Jack Doherty is a Northern Irish studio potter and author. He is perhaps best known for his vessels made of soda-fired porcelain. He has been featured in a number of books, and his work has been exhibited widely in both Europe and North America. Jack started the day with a presentation entitled 2008 – 2018 The Place of Pots. Having potted happily in Hereford near The Forest of Dean for 25 years it was a huge decision to move to Cornwall to the Leach Pottery to ‘restore it back to a functioning pottery’. He arrived to find stainless steel equipped studios like operating theatres waiting for the magic to happen; no kilns but plenty of light! Jack set to work designing and producing functional pottery; choosing to take a closer look at what makes ‘The set’, colour, shape etc. He considered the saying ‘Things you use every day should be beautiful’ and so broke the concept of ‘The set’ by using different colours; for example a black cup with an orange saucer. He used a local wild stoneware clay from St Agnes loaded with iron. Gradually the pottery became more stable, and Jack was able to devote more time to developing his own work, amongst the ghosts of the great masters of pottery. 2015 saw a move away from the Leach Pottery and for Jack it was back to being a potter, and revisiting his fishing heritage. 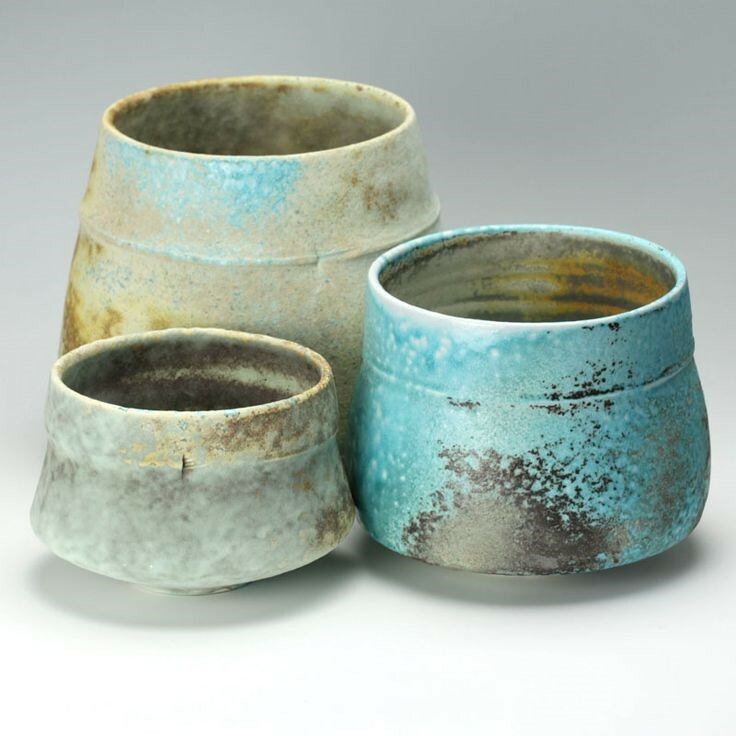 He wanted to work towards using one type of porcelain clay, one slip and a single firing. He built a gas kiln for soda firing fuelled by propane. The slip used is porcelain clay with 2% copper carbonate, and the colour work is done through the single firing, alternating between oxidation and reduction more than once during the firing, with the addition of soda introduced through spy holes, the amount of soda added affecting the colour. He fires to a max temperature of 1240 – 1250oC (cone6), to maintain a matte finish. There were no books written on soda firing of this kind only salt glazing so it was through adapting the known salt methods with much trial and error that Jack continued to perfect his methods, and he still considers the process as ‘experimental’. The application of the slip is achieved using a garden weed killer spray gun, adjusting the nozzle and pressure to get the desired effect, this way the slip can be built up gradually. 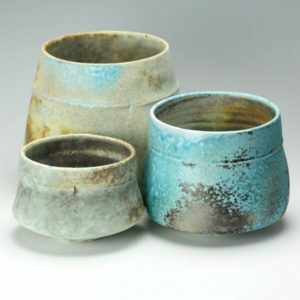 The blue patches are as a result of the soda sprayed in during firing, and the matte finish is due to the lower firing temperature. The black almost smoke like markings are achieved by heavily reduced copper at around 950oC. This type of firing has a heavy casualty rate as it is hard to judge and many vessels simply crack, but it is this interaction with the actual firing process that excites him, and makes his work so unique. With only a few tools namely; a comb, a smooth edged pastry cutter with handle, callipers, a Japanese cutting tool, the ubiquitous credit card and a cheese wire Jack is able to create and refine his work on the wheel. He likes to use a studded wheel-head and batts, making it easier to move things to and from the wheel. Before throwing he considers form, weight and balance, how the piece will interact with the user, the handle the rim. Using a porcelain clay – Potclays Harry Fraser 1149, (shrinkage around 18%) he cones each lump before attempting to form an object, this helps to reduce the cracks. He doesn’t get hung up about centering, he believes it could become a barrier to successful throwing for the novice; go with the flow and if it’s slightly off centre, live with it! Throwing in Porcelain needs to be accomplished fairly quickly with a minimal amount of water to maintain its energy and shape. Instead of a rib he uses a pastry cutter to form concave sides and a metal serrated kidney to make his mark at the end of throwing; almost as a full stop, a conclusion of the throwing stage. The mark also gives the piece a front and back, a starting point. The base he leaves to a thickness of 1 cm so he can turn into it and this also provides strength avoiding slumping. Most cups are made to 10×12 cm, this is not only hand friendly, but is seen to be the optimum size aesthetically. Once thrown the piece is left overnight before wiring off, those that don’t require turning have their bottoms smoothed by a thumb. For a tea bowl he recommends using a 500g ball of clay, coffee cups 200g clay and a tea cup 300g clay. Worth using a measure stick and weighing the clay to ‘get your eye in’ before you are able to fairly accurately guesstimate the sizes. For handles Jack recommends starting with a ‘carrot’ size and shaped piece of clay and pulling the handle from this, it is not advisable to pull the handle directly off a Porcelain piece as you can do with stoneware. If you make 20 cups, make 24 handles! Leave the handles overnight with the cups and attach using scoring and mixing the slip on the piece with a little water and jiggle firmly in to place. Footrings – turn when leather hard, dampen the batt and place the pot in the middle, centre as best you can and secure with nobs of clay, use a loop tool for trimming up the sides at the base then form the footring at the top. Alternatively add a coil of clay to the base, joining carefully and meld in to place, trim and smooth with a credit card or kidney. Bases are left at around 6mm to reduce slumping and to provide strength. On a large piece careful attention to the angle of the base is required to avoid slumping. Shaping from the round – to make a pot into a ‘soft’ triangular or square shape he uses a batt and presses it against the pot whilst it is still on the wheel before wiring off. To turn this shape he uses a small surform blade and adds a coiled footring. The finale was a pot thrown with 10 kg of porcelain, simply amazing – thank you Jack.